GT Automation Group's engineering experience is the cornerstone on which our automated production equipment, and systems integration success is built. We have experts on staff who specialize in electrical and mechanical design, pneumatics, hydraulics, tool and die, fixtures, controls design and programming. We invest in state-of- the-art engineering capabilities such as Unigraphics, and AutoCad. Our manufacturing area is filled with CNC machine tools and the most advanced CNC programming systems such as Surf Cam and Shop Cam. 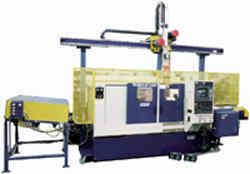 GT has extensive experience with designing and building automated equipment. We can create manufacturing solutions by drawing from our extensive databank of automation building experiences. do not have Acrobat Reader, click on icon below.